2018 Jayco Journey caravan for hire in Wallan, VIC. Perfect for families to enjoy camping in luxury! Easy to tow with flexible check in/out times. Sleeps 5 plus option to sleep 2 extra adults/teens comfortably in annexe using our deluxe king single stretchers. We’re happy to arrange drop off & pick up and can have everything set up ready for you to start relaxing on arrival. Tow vehicle must have a towing capacity of a minimum 3 tonne. Must have previous towing experience. Caravan comes with a 12 pin plug. If needed, we will supply an adaptor to suit your vehicle. ***CHECK OUT SPECIAL PROMO OFFER outlined below. Comes with all the bells and whistles to take the hard work out of camping. Toilet & separate Shower // Queen Island Bed (extra long 2.04cm) // Triple Bunks (super comfy bambillo mattresses) // Air conditioning & Heating // TV/DVD // CD/Radio // Indoor & Outdoor Speakers // Oven & Microwave // Fridge & Freezer // Fully equipped kitchen // Cafeteria & Ground Coffee // Games & DVD’s // External hot & cold Shower perfect for washing off sandy feet. *** NEW LISTING PROMO *** SAVE $150 on optional extras listed below on all bookings made prior to 30/06/19. 1. No smoking in the van. 2. Van must be returned clean. 3. Limit of 3 Dad jokes per day!!! (only joking, the more laughs the merrier!). Perfect option for those who would prefer to simply turn up ready to relax, without any set-up or pack-up, this option will ensure you make the most of your time away. 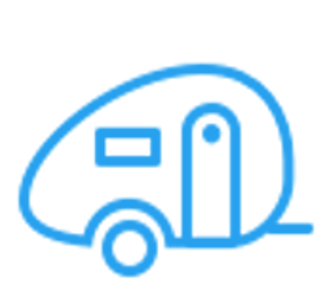 We can transport and set-up the caravan to your holiday destination within 300 km's of caravans storage address for $1.50 per/km return (minimum charge of $200 return for shorter trips), plus an additional $100 set-up/pack-up fee. This option includes setting up and packing up the awning, full sized annexe, BBQ & camping gear so you can make the most of your break. *Please note we will waive the additional $100 set-up/pack-up fee for any bookings over 7 nights. $140 per night for Peak Periods, including VIC School Holidays, Public Holidays and long weekends. $125 per night for Off Peak Periods, covering all other dates. A security bond is held on hiring in the case of any damages, missing items or if the cleaning requirements are not met on inspection of the van, any costs will be deducted from the bond. If the van is returned in the same condition as hired your bond will be promptly returned to you within 2 business days. To not incur a cleaning fee the van must be returned in the same clean condition as it was received. Suitable cleaning products will be supplied. *A minimum cleaning fee of $199 will be applied if toilet not emptied and cleaned. Love an adventure with my family and going to the bush to relax and unwind. Big fan of prospecting for gold & relics.